The presence of coal in the George’s Creek Valley was known as early as 1736. Maryland coal was first used at a nail plant in Hagerstown in 1789. 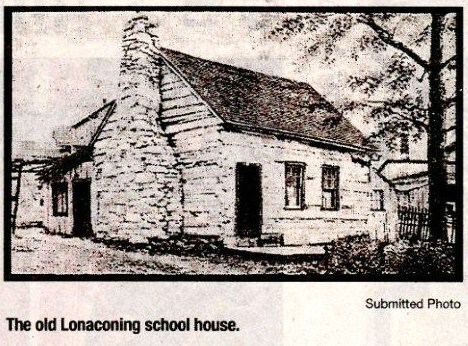 In 1839, George’s Creek Coal and Iron Company reported that Lonaconing was a flourishing village of 700 souls. The company purchased all available homes in the area and these were rented to certain employees who operated them as boarding houses, charging $3.00 a week for food and lodging. Peter Sampson was born in Scotland in 1825. He came to the United States with his parents and siblings. The family settled in the Lonaconing area and Peter and his father found work in the Detmold Mine. In 1860, the family consisted of Peter, his father, Peter; his mother, Jennett; a sister, Jean; a sister, Margaret and Margaret’s two children, Jennett and George. Peter, the son, was killed in the Detmold Mine December 18, 1862 at age 37 years, 7 months, and 8 days. In 1870, Peter, the father, then age 72 and young George, his grandson, age 15 were still working in the mines. In 2015 it is hard for us to imagine one so old and one so young doing the hard, strenuous work of a coal miner. However, there were still five people in the family to support. I wonder how old young George was when he first held the pick. The Coal Miner Memorial Statue Fund is gratefully accepting contributions for the placement of an educational Memorial at the crossroads of Rt. 36 and the National Road in Frostburg. A bronze statue will honor our George’s Creek Valley miners, and name those who perished while mining. Tax-deductable donations can be mailed to the Foundation for Frostburg CMMSF, P.O. Box 765, Frostburg, MD 21532.